The Euro Dollar was best performer yesterday despite the turmoil that went on in its financial markets. It gained 1.5% against the Australian dollar. Commentators and market analysts are at a loss as to why this occurred. There doesn’t appear to be a logical reason. Sometimes S…. happens. Chinese stock markets fell despite monetary easing measures to curb recent volatility. The main index lost 3.3% yesterday taking its decline of the past few weeks past 20%. Global stock market falls saw funds go from stocks to bonds. With Australia’s bonds the most attractive in terms of yield and safety the AUD gained 1% yesterday. Iron ore fell 0.3% but remained above $60 a ton. Capital Economics, a research company, said yesterday that the commodity should fall as low as $40 a ton this year and close out at $45. This comes despite an interest rate cut in China over the weekend. The price of EVA foam mats have remained steady. Despite fluctuations in the AUD the major supplier of EVA jigsaw Foam Mats in Australia, Ezymats, has maintained its super lower prices. 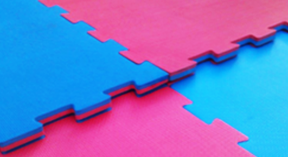 Ezymats is a supplier of foam jigsaw mats with head quarters in Sydney and a warehouse in Melbourne. The Sydney and Melbourne warehouse allow Ezymats to easily supply foam mats throughout Australian.